Our Madrid tours are amongst the most unusual in the city. Our guides all have PhDs – and a love of Spanish history! When was the Spanish civil war? The war lasted between 1936-39. In many ways it was a rehearsal for WWII. 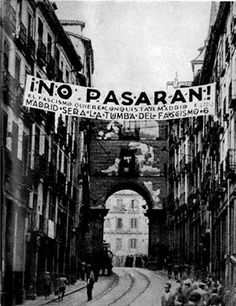 Our Spanish civil war tour in Madrid explains why the conflict was so important. Why was the siege of Madrid so important? As the capital of Spain and the seat of the government control of the city was crucial to both sides. General Franco could only claim to have won the war once he had taken control of the city. The legitimacy of the republican government relied largely on their ability to hold Madrid. What was the Nationalist plan of attack? What were the problems with the Nationalist plan? The nationalist plan of attack was defeated partly by the peculiar geography of Madrid. Firstly, troops had to get across the river Manzanares which runs down the western side of the city. Secondly, Madrid is at the top of a steep slope or escarpment which rises steeply from the river bank. Under sustained fire the assault turned out to be far more difficult than the nationalist commaders anticipated. So why did the Nationalists not try a different approach? Because all the alternatives looked worse. The nationalist army tried to take Madrid from the north but failed. (This sector is explored in our tour Hemingway and the War in the Mountains). Then in early 1937 the Nationalists tried to go round Madrid and attack the city from the east through the valley of Jarama. But this attack failed too. (This is the subject of our walking tour Charlie Donnelly and the Battle of Jarama). So, despite the evident risks, the only real choice was an attack from the west. Why did the Republicans not counter-attack? They did – but not successfully. In the summer of 1937 the republicans launched a huge offensive to break the nationalist line at Brunete around 30km from Madrid centre. But this too failed. (This offensive is the subject of our tour Gerda Taro and the Brunete offensive). What were the International Brigades? The Spanish civil war was in fact a very international conflict and foreign troops fought on both sides. Hitler’s Germany and Mussolini’s Italy sent professional soldiers and equipment to assist Franco, whilst Stalin’s USSR supplied military aid to the republican government. Thousands of individual volunteers also decided to stand up and be counted. Whilst there are plently of memorials to the volunteers of the International Brigades outside Spain there is little in Madrid. 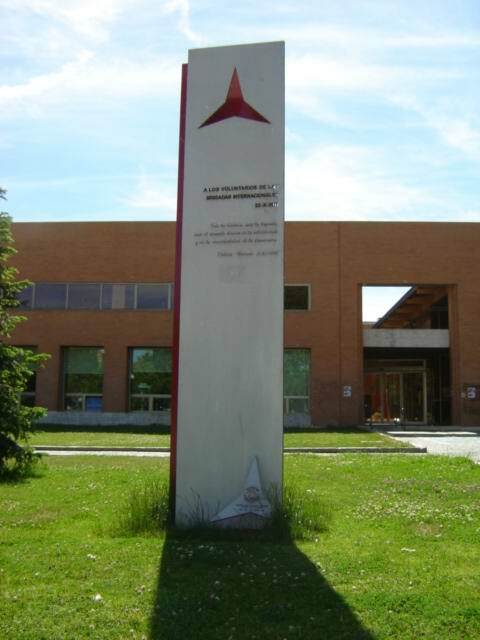 The memorial on the campus of Complutense university (above) became the focus of an international controversy when a Madrid court apparently ordered that it be removed. Read David Mathieson’s article in the Guardian on the subject here. Why do the walking tours start at Parque Debod? In 1936 the Monataña barracks stood in the space occupied by what is now the Debod park. When Franco and the other rebel Generals declared their coup in July 1936 they expected that the garrison at the Monataña would join them. Had the professional, well-armed troops stationed in the centre of Madrid sided with the rebels, the Republican government would have been overthrown in a matter of hours or days. But the troops at the Monataña did not support the attempted coup. Instead, the barracks became a vital flash point in the siege of Madrid and scene of a terrible massacre. 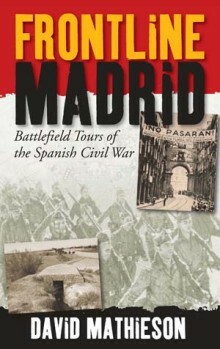 The fascinating story of what happened at the barracks had a profound influence on the fate of Madrid, and the course of the war. All our Spanish civil war tours in Madrid tell the full story of that fateful, intriguing episode. Click here to see some fascinating orignal newreel film of the events – the commentary is in Spanish but images are powerful and the notes below will explain the sequence of events. Badly. By the end, whole districts of the city were in ruins and thousands were starving. It is estimated that more than half a million Spaniards fled over the Pyrenees to France and thence into exile. When France itself was invaded a few months later, thousands of Spaniards were passed on to Nazi concentration camps. Of those that stayed, thousands more were subject to a vicious repression, which continued during the 1940s whilst the rest of Europe was at war – a war which really began here in Madrid.